Teachers always need pens. When I substitute taught, I found myself constantly looking around the teacher’s desk for pens, to which there were none. It seems there are never enough, and they’re always magically “disappearing.” Seriously, there must be a pen thief in every single classroom. So, with teacher appreciation week coming up next week (and Mother’s day soon!! 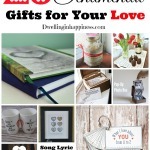 ), this little craft is the perfect gift! 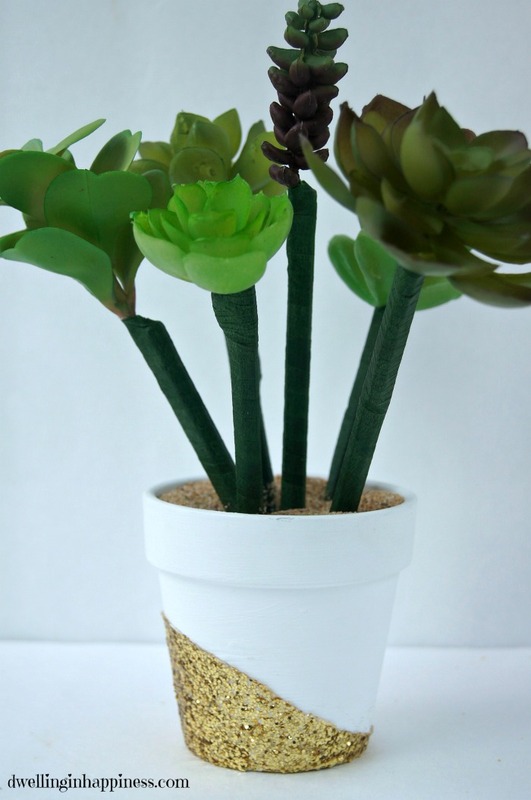 Instead of the usual faux flowers for this “flower pot,” I thought it’d be fun to try something different; succulents! Since they’re all the rage right now, finding succulent picks was no problem at all. Michael’s had everything I needed. You can easily make this in an afternoon. Or in my case, during naptime! 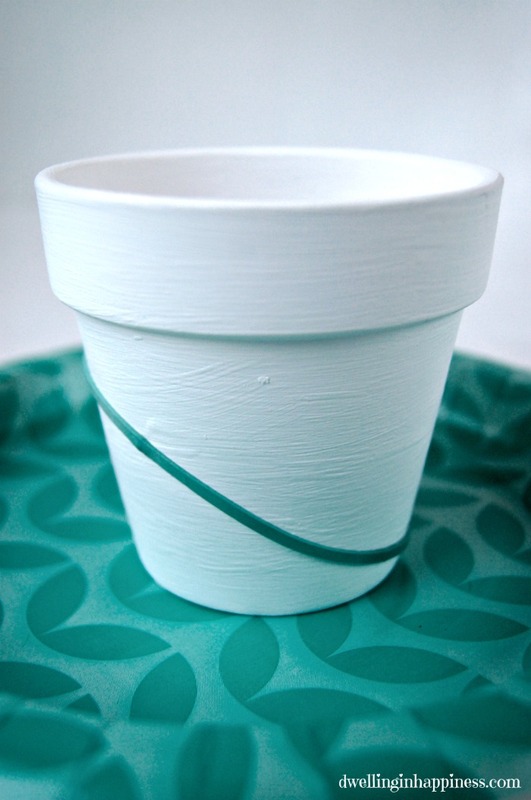 Start by painting your pot with the white acrylic paint. I painted inside about an inch down as well. 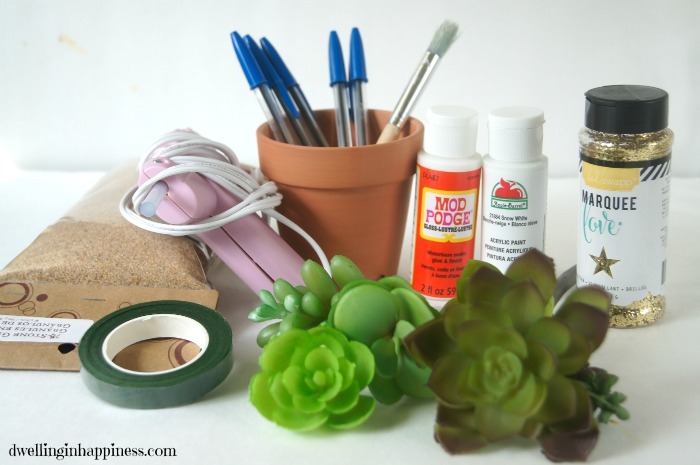 While the pot dries, use the green floral tape to attach the succulents to the pen. My succulent picks had a thick plastic coating, so I just pulled them out so they’d be thinner when taped to the pen. Start at the very top of the pen and just under the succulent. 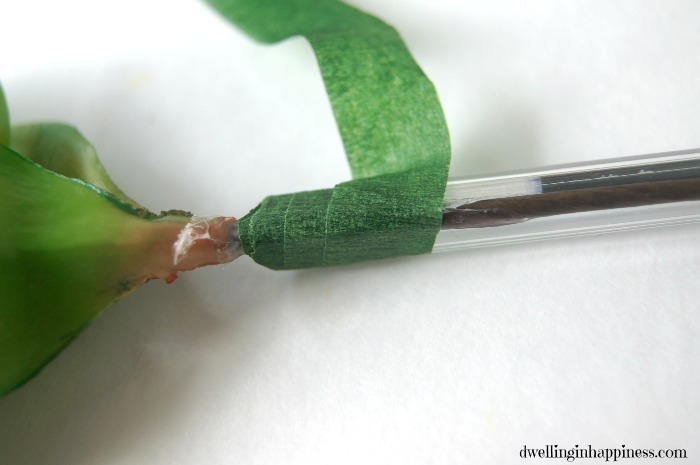 Wrap the tape around a few times to make sure the succulent is secure. 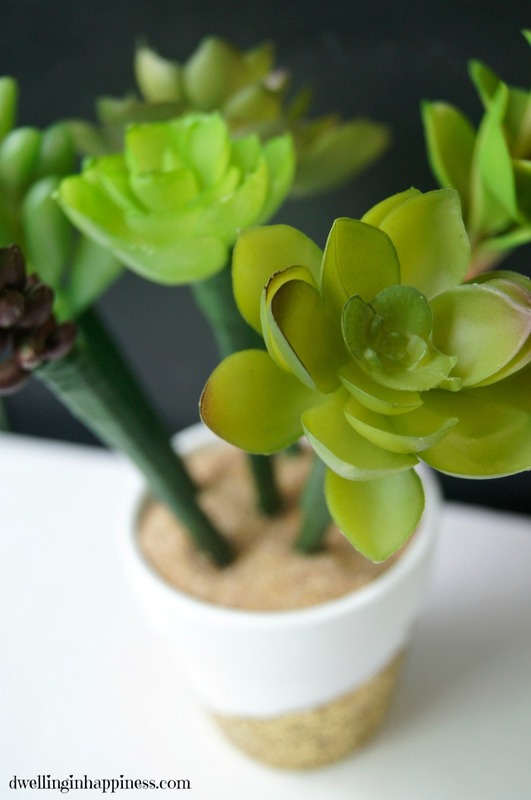 If the succulent is moving around too much (one of mine was missing a stem completely), just add a little hot glue to the stem and hold it against the pen until it dries, then wrap with floral tape. 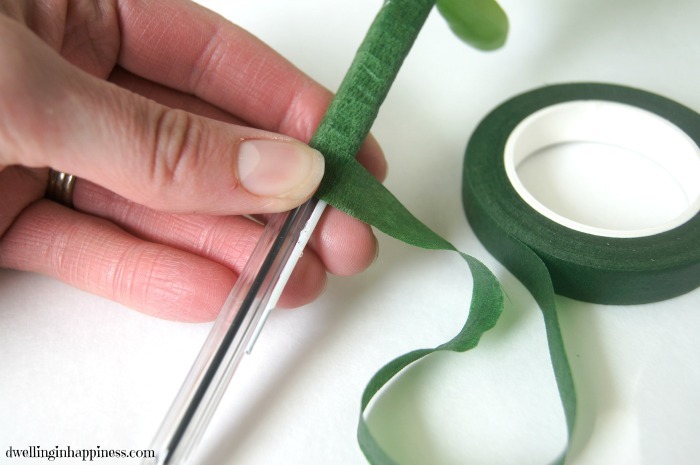 Slowly work your way wrapping the tape down and around the pen, pulling tight to keep it all together and to ensure the tape will stick to itself. Once you get to the bottom, leave a centimeter or two of the pen showing in case you want to put the pen caps back on. 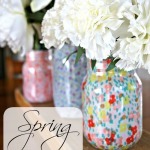 Rip off the floral tape and push it down so it sticks. Once you rubberband is in place, use a paint brush and brush on Mod Podge below it in small sections, adding glitter as you go. Continue all the way around the pot. 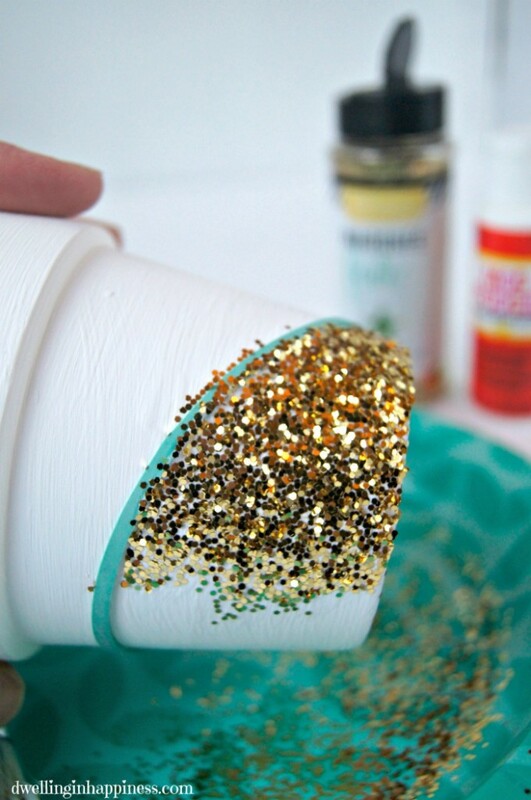 Once the Mod Podge is dry, use your paint brush and brush on another coat on top of the glitter to set it so it won’t come off. Don’t worry, I promise it’ll dry completely clear and you won’t even know it’s there! Don’t skip this step, or you’ll have glitter everywhere when you go to use it! 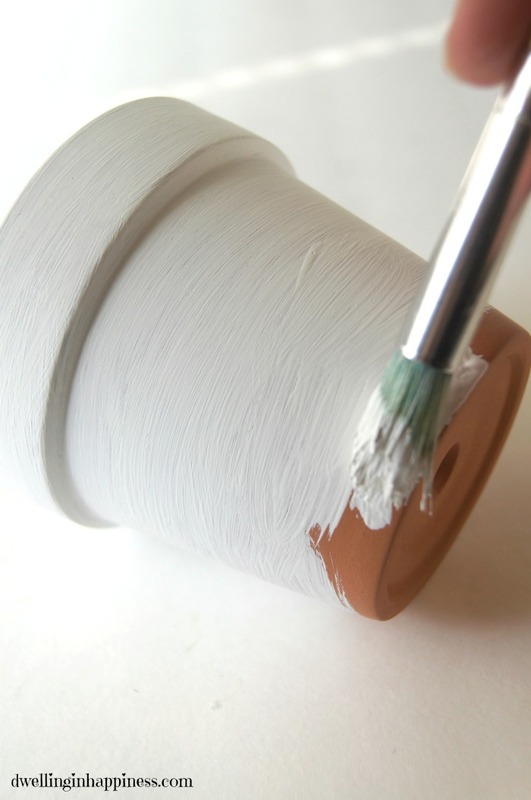 Once the Mod Podge is completely dry, carefully remove the rubberband. 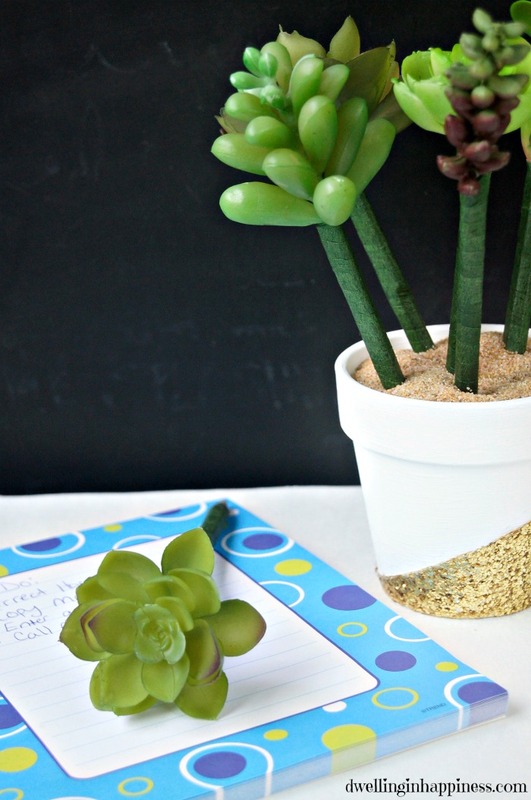 Add some sand, beans, or little rocks to the pot and stick in your succulent pens! You now have the cutest and easiest little gift to show just how much you (and your child!) appreciate their teacher! And being a former teacher myself, I can attest that any teacher would love this. I kind of wish I still was teaching just so I can show these cuties off on my desk! And guess what? Now your child’s teacher will actually have pens that wont’t roll away and magically disappear. They’ll be thrilled! 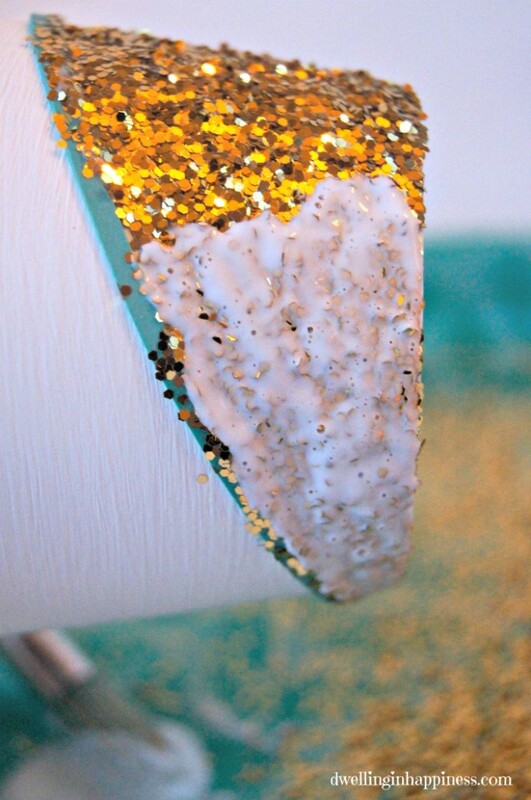 And gold glitter because, well, it’s gold glitter!! And who doesn’t love gold? 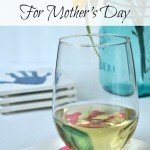 And also being a mom, I can attest again that any mom would love this for mother’s day. So dads, if you’re reading this, get moving! The kiddos can help, too! 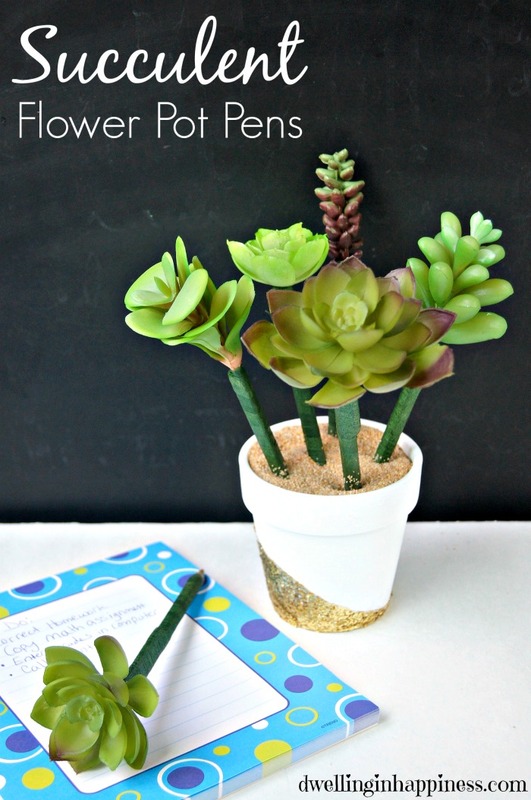 Do you give anything to your child’s teacher for teacher appreciation day? 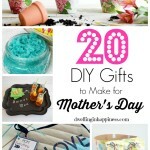 Need some more Mother’s Day gift ideas? Visit HERE to see 15 more ideas! Thank you, friend! Hope you’re enjoying your weekend!! I am so in love with these, what a great idea! This would be so cute at a doctors office, too. Succulents are so fun! Aw thank you, Carrie! It’d totally be cute at a doctor’s office, too! 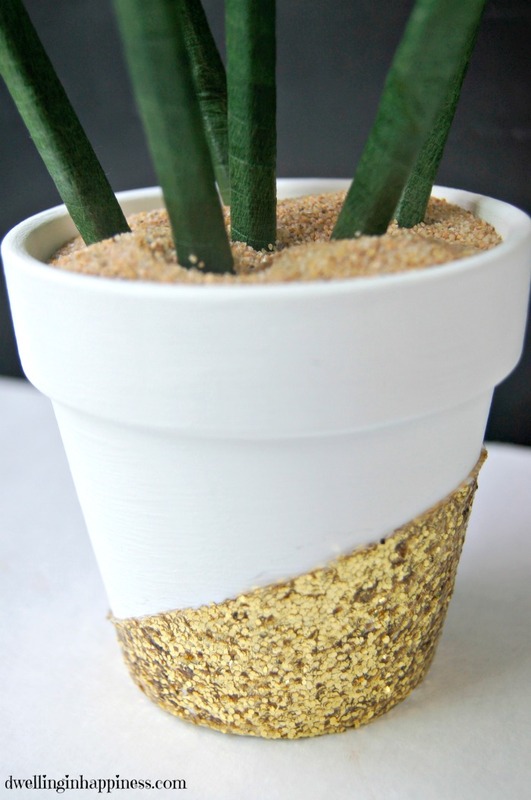 I’m SO (obsessively) into succulents right now. 😉 But who isn’t?! Ha! Hope you’re having a great weekend!! Hi there! Visiting from Hit Me With Your Best Shot. I love succulents! This is so cute and I love the gold accent! 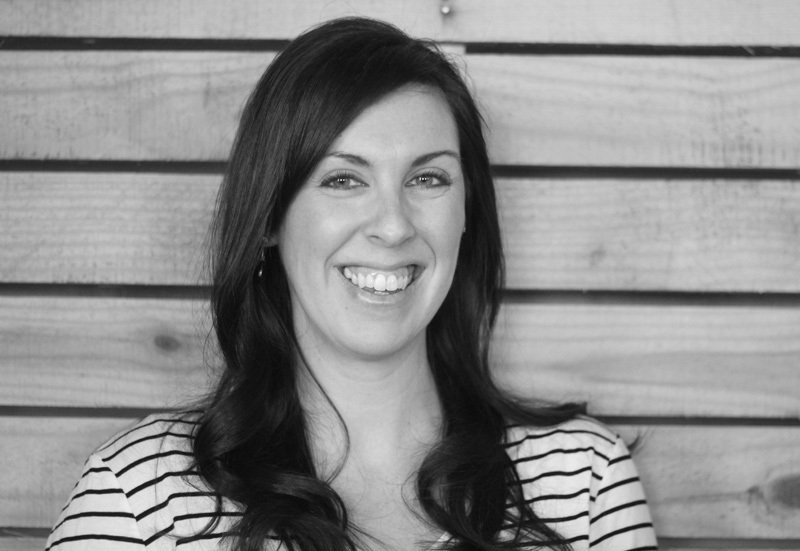 Hi, Ashley! Thank you! I totally am obsessed with succulents. And gold, of course! 🙂 Have a great rest of the week! 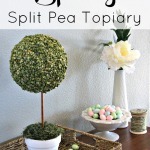 Wow what a sweet and creative idea! I love how it look and even better its functional too! Would look gorgeous on any desk. Thanks for the idea, visiting from Hump Day Happenings. 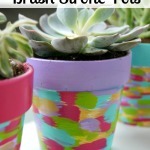 I love succulents, this is an awesome idea. Thanks for posting. Hello from Think and Make Thursday. Thank you, Melissa! I’ve been loving succulents too, I can’t get enough of them! 🙂 Hope you have a great weekend ahead! This is the cutest idea! I would never have thought of this myself. 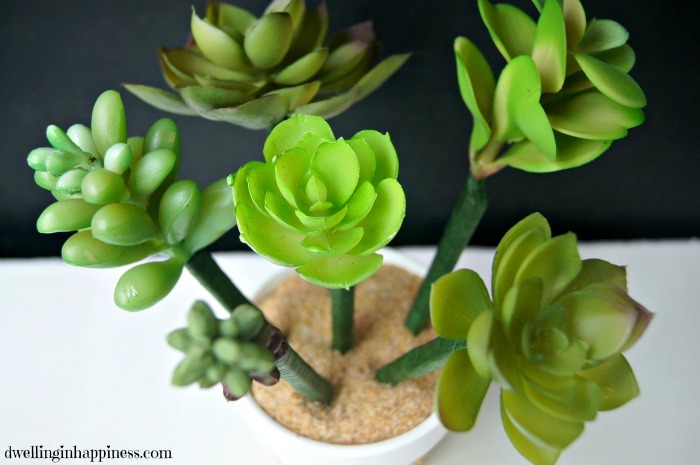 I’m obsessed with succulents, and even these plastic ones look so pretty. Thanks for sharing! Thank you so much, Nazia!! 🙂 Thanks for stopping by!